Want to save your iPhone media files to computer? No need to think about the limitations that you often face with your Apple device, we can help you do your iPhone to PC transfer for your favorite files just in a click. That too, without thinking about the accidental deletion and data loss. Crafted and designed by 'iMyFone', TunesMate marks its place as a profoundly distinguished third-party alternative exclusively intended for Window and Mac users with iPods, iPads, and iPhones. One of the most praised features that make it different from the mob is its ability to transfer files smoothly between devices, iOS to iTunes PC and vice-versa while allowing the user to merge different iTunes libraries together. 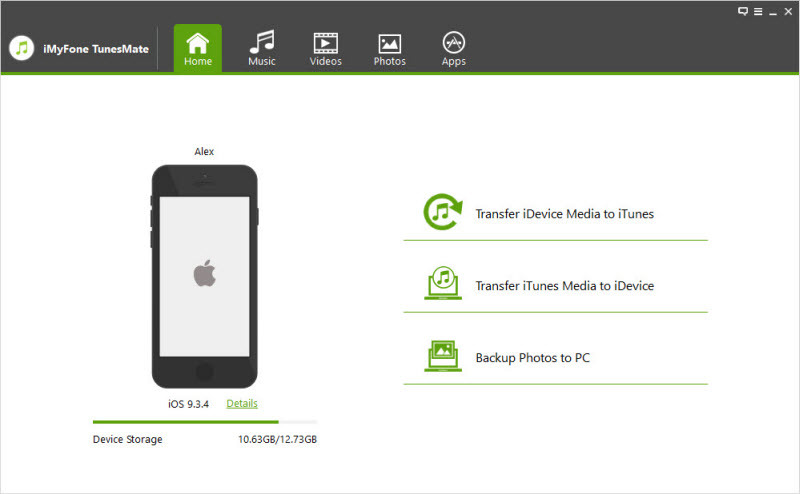 Its two-way transfer functionality enables you to transfer your files from iPhone to PC and PC to iPhone. Import or export videos, photos, music or more, transfer anything effortlessly as per your wish. Get a full hold on what you're transferring while previewing the files you select. Break the limits that iTunes and enjoy file transfer just with a click and feel free to manage all your iTunes data your way. If you are looking for iPhone to PC transfer for your favorite files, TunesMate is the solution you have waited for years. You need not be a tech geek to use it, just 1-2 minutes and you can use it like a pro! Here is the way to export your photos from iPhone to PC. Launch TunesMate in your PC and connect your iDevices to PC. You can go to Photos>Camera Roll and selectively transfer your photos to the selected folder. 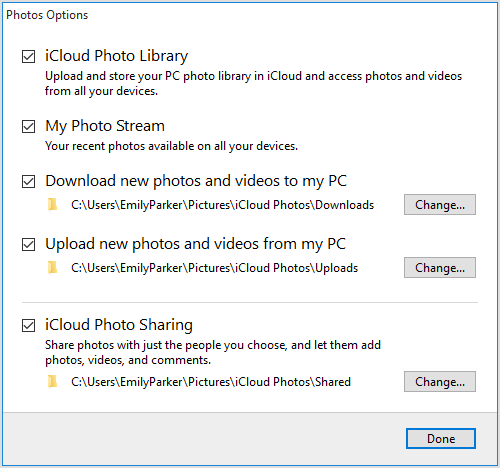 Or simply Click Backup Photos to PC/Mac> to backup all photos in a go. Super easy, right! Proceed to open iCloud for Windows. Search for Photos and click Options next to it. 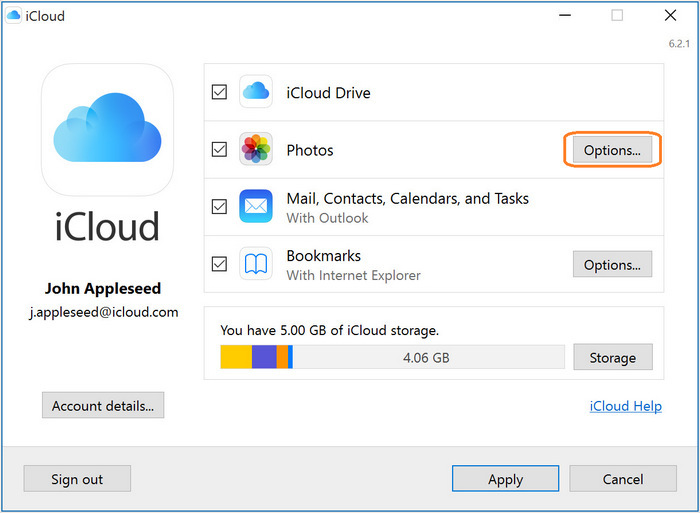 Backup with iCloud is convenient, but each one only has 5GB free storage to use. You'll have to pay for extra space. Also when your internet is not so stable, syncing is not always successful. iMyFone TunesMate acts as a single shot solution for all your 'iPhone to PC transfer' problems. 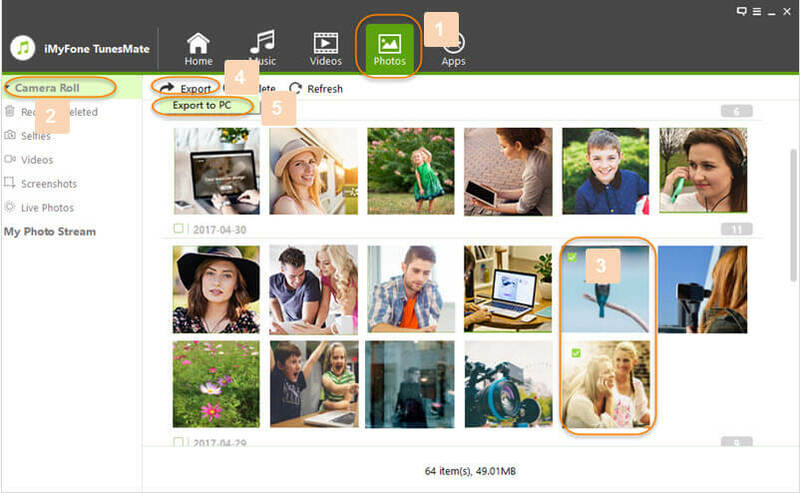 Weather photos, apps, videos, music or more, it lets you transfer every media file without fearing data deletion and losses. Further, it also rebuilds damaged and corrupted iTunes library, thereby giving you more hold and authority over your personal files. Unstable internet connectivity issues? Well, TunesMate passes this boundary too!